"The town's annual report for the year ending January 31, 1899 noted that there were 50 teachers and more than 1,500 students throughout the school system. Of that total, seven teachers, including the principal and 196 students were at the high school. According to the report, the staff included Principal Charles H. Howe, First Assistant Helen W. Poor, and teachers Jennette S. Wendell, Emilie E. Emerson, Jessie D. Pierson, Clara A. Barnes, and Mabel P. Wall. The eighth person in the picture may be janitor George Russell. The report also indicated that there were 20 graduates nine who studied the English course of study and 11 who studied the Classical course of study. It was estimated that the high school enrollment would increase to 225 students the following year." - Text from calendar by Jayne M. D'Donofrio. 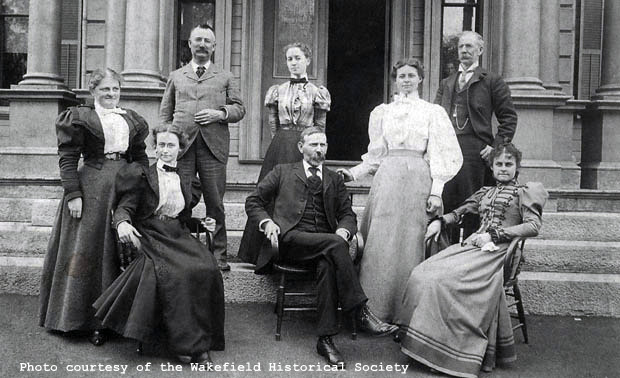 “Wakefield High School staff, 1898,” NOBLE Digital Heritage, accessed April 22, 2019, https://digitalheritage.noblenet.org/noble/items/show/7133.